toon|Vocalise Scope Support - toon,llc. "Vocalise Scope" is a new diagnostic vocal pitch-visualizer for iPhone. It has also the Recording function with the pitch analysis. It can display your vocal pitch in real-time. It will assist you visually for training your a cappella vocals and practice of Passaggio. Please be exploited to improve the ability for your singing. On sing a song, what do you recognize your pitch on scales? Working on scales is an important part of learning how to control your vocal, developing your voice and keeping your voice in good shape. This app can perform two methods of sound analysis for vocal pitch estimation, "Sonagram" on the piano scale and "Vocal-score" in the staff notation. It includes the sound recording function for sound analysis. Please to click the following link to download "Vocalise Scope" from App StoreTM. It will be open the download page on App StoreTM. Sound analysis for human vocal range. Self-training of a cappella and solo vocal. Pitch display of sound components contained in the human voice. There are two methods of following sound analysis of this application. Depending on the degree of confidence, the pitch estimation results are displayed in dot colors. Red indicates that the pitch estimation is the most reliable, the second candidate is Green, the next third is Blue, and more followings is displayed in Gray scale. The estimated pitch result is displayed a line graph on the staff notation with a pitch name. "Vocalise Scope" has two modes of operation, Live mode and Playback mode. LIVE Mode : It performs sound analysis by obtaining real-time sound from the built-in microphone. The recording data is temporarily saved simultaneously. This is Top view to control main functions of this app. 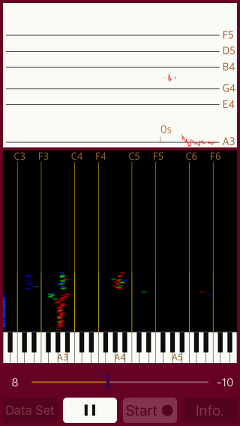 The trace display is located in the upper display area, it displays the result of sound analysis. 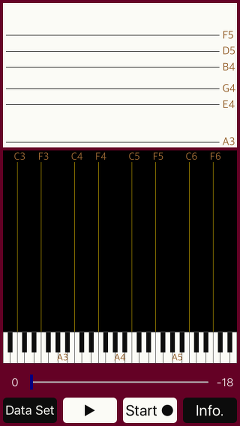 Vocal-score on the top and Sonagram on the bottom are displayed at the same time. The operation buttons are located in the lower area. The access permission to the microphone will be confirmed from the iOS system at the first start-up. Please enable access to the microphone. The basic operation is very simple. However, please note that the operation will differ slightly depending on the operational mode. The functions of the top view control buttons are as follows. It displays usage method, product information, support website link and data storage settings. When launching this app, INFO view will be displayed first. To return to the main view, tap "CLOSE" button. It starts or stops sound analysis in Live mode. Recording data is temporarily saved. It automatically stops in 3 minutes. > Set the recorded data or load data as sound analysis data. It backs to the beginning of data. When the data is set, Playback mode is effective. Tap "START" button to switch to Live mode. Replays/pauses sound analysis for recorded data or loaded data. Indicates the position of playback time. With the slider you can change the playback start position while pausing. Tap ”START/STOP" button, the sound analysis will start. Tap "START/STOP" button again, the sound analysis and display will stop. It stops automatically at maximum 3 minutes. It is temporarily saved as recording data at the same time. In the Playback mode, this sound recording data can be used again when displaying the sound analysis display. 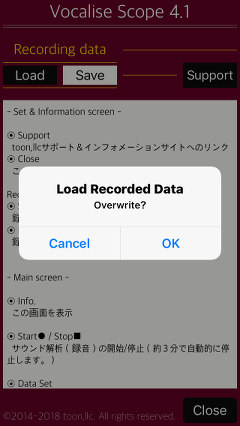 Load recorded data or saved data in live mode. PLAY/PAUSE(lower left button) : it plays sound data and analyzes sound. It can play the recording (loaded) data and start/pause sound analysis. To repeat playback, pause and return to the point you want to replay by Time Slider. If you play to the end point of the sound data, the data setting will be initialized, so you need to perform "DATA SET" again. Indicates the position of playback time. During pause, you can change the playback start position by the slider. 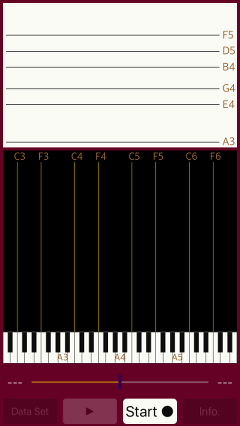 Tap "START" button, sound recording starts simultaneously with sound analysis in Live mode. Tap "STOP" button to stop them. Recording data is temporarily saved, but if you tap "START" button again it will be overwritten. If you want to save the file, you can save the recording data with "SAVE" in "Recording data" setting and load the saved data with "LOAD". You can load the saved data by "LOAD" button and you can perform sound analysis using the loaded data. It is held until new recorded data is generated in Live mode. At tap of the "INFO" button, it will be displayed on the product information. If you tap the "SUPPORT", Safari starts and you can see our support page. By tapping "CLOSE" button, it returns to Top view. Vocalise Scope version 4.3 was released on November 20, 2018. Vocalise Scope version 4.2 was released on July 3, 2018. Vocalise Scope version 4.1 was released on July 1, 2018. Vocalise Scope version 4.0 was released on March 13, 2017. Vocalise Scope version 3.1 was released on March 9, 2016. Vocalise Scope version 3.0 was released on November 28, 2015. * App name was changed to "Vocalise Scope" from "fo-Vocalise". fo-Vocalise version 2.2.1 was released on March 6, 2015.
fo-Vocalise version 2.2 was released on February 28, 2015.
fo-Vocalise version 2.1 was released on September 3, 2014.
fo-Vocalise version 2.0.1 was released on July 16, 2014.
fo-Vocalise version 2.0 was released on June 26, 2014.
fo-Vocalise version 1.0 was released on Feruary 3, 2014. "Vocalise Scope" is intended primarily for a single vocal of the human voice. Please note that the correct display can not be done in case of chorus, vocal with musical instruments, and the noisy environment. Recommended for use in a quiet room less ambient noise as much as possible. In Vocal-score mode, it is sometimes impossible to accurately estimate with a short tone utterance, so please use it to confirm the pitch with a long tone utterance. Please note this app does not support the audio input by an external connection, such as a digital audio interface. At the time of the first access to microphone after installing the app, you will be asked permission to access them from the iOS. If you did not enable this setting on this time, it can not be access from the app by privacy restrictions of the iOS. Please enable slide switch of the app in the access permission of the iOS setting, "Settings > Privacy > Microphone". Please send a review message for "Vocalise Scope"